SYDNEY (CNS) — When Cardinal Edwin F. O’Brien was named grandmaster of the Knights of the Holy Sepulchre in 2011, he found himself embroiled in a war a world away from the jungles of Vietnam where he ministered to dying troops as a young priest. “The forces that are at work now are intent on eradicating the Christian civilization, nothing less,” said the 76-year-old U.S. cardinal, who was in Sydney in October to reach out to the order’s 600 Australian members. Christians in the Holy Land face “daily horrors,” while “our public is very blase about the whole thing,” Cardinal O’Brien said. 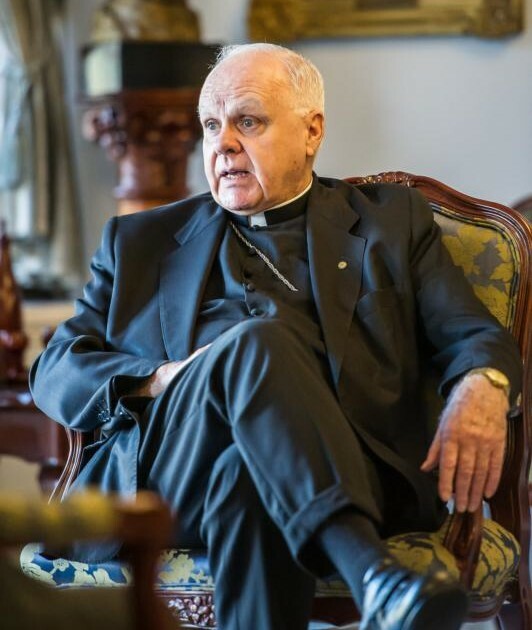 “Unless we face the facts, this radicalism, this extremism, is going to keep spreading,” he told The Catholic Weekly, newspaper of the Archdiocese of Sydney. Islamic State militants attacked Assyrian Christians, one of the world’s oldest Christian communities, in northeastern Syria in February. Reports on the assault note that the militants emptied about 30 villages, kidnapped up to 300 people, destroyed churches, and forced about 1,000 local Assyrian families to flee their homes. Most disturbing for Cardinal O’Brien is the lack of military response from the United States. Born and raised in New York, he was ordained a priest in 1965 as the United States Military Academy at West Point was preparing to double in size. The young priest was appointed to the academy, initially as a civilian priest on a temporary posting. That posting stretched to five years and he was so impressed by the tenacity shown by a generation of young men that he could no longer remain on the sidelines, Cardinal O’Brien said. Serving alongside troops in combat was the first step toward gaining their trust, the cardinal said. His Vietnam experience strengthened his faith, he said, noting that he considers military service to be a lofty vocation. “Christ said, ‘I have come to serve and not be served’. When one puts on a uniform that person enters the service,” he said. Decades later, another war defined another chapter of his religious life. In September 2001, Cardinal O’Brien was four years into his tenure as coadjutor of the Archdiocese for the Military Services, overseeing the nation’s 1.5 million Catholics in the military, when the country was struck by terrorists. On Sept. 11, he was at his desk in Washington, where the military archdiocese had been hosting a retreat for 40 priests who were chaplains to local military units. Cardinal O’Brien drew public and media scrutiny when he appeared to endorse U.S. military intervention in Iraq in the context of just-war theory. Cardinal O’Brien left the military archdiocese in 2007 when he was appointed archbishop of Baltimore. He said his appointment as grandmaster of the Knights came as a shock after less than four years in Baltimore. To serve them “is to serve some of the poorest in the world, and some of the most persecuted Christians,” he said. McCowen is on the staff of The Catholic Weekly in Sydney.